This Vegetable Tanned Leather Holster is a Great Foraging Toy for your Bird. Pack with your Bird's Favorite Treats to Provide Hours of Fun. This Leather Spiral - made from Vegetable Tanned Leather - makes a Great Millet Holder. Makes your bird have to work a little harder to get to one of their favorite treats. 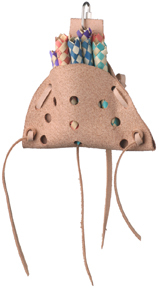 Another Great Vegetable Tanned Leather Toy your bird will Love. Stuff with you Parrot's Favorite Treats to make a Wonderful Foraging Toy.